I determined not to thank you for the Turkey until it was quite gone, in order that you might have a becoming idea of its astonishing capabilities. The last remnant of that blessed bird made its appearance at breakfast yesterday—I repeat it, yesterday—the other portions having furnished forth seven grills, one boil, and a cold lunch or two. It is a generous letter, fully in keeping with the generosity of the people he is addressing. Still, like many people who write to express their thanks for unexpected or unwanted Christmas gifts, it seems that Dickens could not resist poking gentle fun at the purchasers’ taste, not least by hinting that sending him a turkey the size of a small child was perhaps being generous to a fault. Is there a note of reproach in “My Dear Sirs”? There is certainly more than one sense in which a turkey that hangs around for a week might be thought of as “that blessed bird,” as is clear from Dickens’s decision to pump up “turkey” into “Turkey,” the double insistence on its final reappearance “yesterday—I repeat it, yesterday,” and the drawn-out sentence that describes the many attempts made by the Dickens household to finish it off (“seven grills, one boil, and a cold lunch or two”), like a chorus of “The Twelve Days of Christmas” in which partridges in pear trees and swans a-swimming have been usurped by this one “blessed bird.” Even the reference to the turkey’s “astonishing capabilities” seems suspended between wonder and worry, as if a turkey that produced so many leftovers came close to being a real-life version of those enchanted objects and creatures—pots overflowing with porridge, or geese laying limitless supplies of golden eggs—that throng the pages of fairy tales. Four years later, Dickens had written something that possessed still more “astonishing capabilities.” A Christmas Carol in Prose: Being a Ghost Story of Christmas was first published just before Christmas in 1843, and since then it has never been out of print. Originally written as a tract for the times, this cautionary tale about the ongoing tussle between greed and goodness has been thought of as timely whenever it has been read. Enjoyed by its first readers as a modern expression of the spirit of Christmas—as modern as Christmas cards, which were sent for the first time in the same year as the Carol’s publication—it has since become popular for quite different reasons: the sense of tradition it is thought to embody, a reminder of the simple pleasures that seem to have been lost sight of in the seasonal scrum of shoppers, an annual invitation to the pleasures of nostalgia. Reproduced so often, and in so many different forms, it has become as much a part of Christmas as mince pies or turkey, with the key difference that, as Martin Heidegger argued was true of all classic works, it has never been “used up.” There have been dozens of films, starring everyone from Laurence Olivier and Ralph Richardson to Mr. Magoo and Mickey Mouse, operas and ballets, an all-black musical (Comin’ Uptown, which opened on Broadway in 1979), Benjamin Britten’s 1947 Men of Goodwill: Variations on ‘A Christmas Carol,’ even a BBC mime version in 1973 starring Marcel Marceau. So regular are the annual returns of the Carol to our stages and screens, in fact, that it has become something like a secular ritual, an alternative Christmas story to its more obviously religious rival, in which the three wise men are replaced by three instructive spirits, and the pilgrimage to a child in a manger is replaced by a visit to the house of Tiny Tim. Even people who have never read the Carol know the story of Scrooge, the miserable old skinflint who repents after being visited by the Ghost of Christmas Past, the Ghost of Christmas Present, and the Ghost of Christmas Yet to Come. So widely and deeply has this story entered the popular imagination that phrases such as Bah! Humbug! have floated free of their original context and acquired the force of common proverbs, while Scrooge himself has entered the language as a piece of cultural shorthand “used allusively to designate a miserly, tight-fisted person or killjoy” (OED, “Scrooge”). This can make it hard to read, even for the first time, without the uncanny feeling that it is both familiar and strange, ancient and modern. As with any story that has developed the power of a myth, as Virginia Woolf once observed, we tend to know the Carol even before we know how to read, and our knowledge comes from many different sources, with the result that any attempt to assess what Dickens actually wrote can be an experience as hazy and disorientating as Scrooge’s first impressions of the Ghost of Christmas Past: “What was light one instant, at another time was dark, so the figure itself fluctuated in its distinctness.” And yet to read his original story closely is to realize that, even though at first it may seem to lack the zip and glitz of later adaptations—there are no Cockney dance routines in the snow, no bustling crowd scenes full of cheeky urchins, no Muppets belting out big musical numbers—Dickens’s plot cannot properly be separated from the strange and haunting power of his narrative style. In both the local details and the overall shape of his writing, Dickens sets out to show his readers that what happens in the Carol is intimately bound up with how it is described as happening. To take just one example, the story of Scrooge’s mean-spirited solitude being replaced by openhearted sociability is echoed in a style marked by narrative generosity. Repeatedly, the narrator lingers over examples of human activities that show companionability spreading from one person to another—Bob Cratchit joining some strangers for a slide on the ice, or Scrooge’s nephew playing games with his friends and relatives—in a way that is as involuntary and catching as a cough. Even the natural world, far from being indifferent to these activities, seems to be working on a similar principle of benevolent overflow, with fog that busies itself “pouring in at every chink and keyhole,” or “great, round, pot-bellied baskets of chestnuts” that tumble out onto the street “in their apoplectic opulence”—a cheering alternative to the water plug, as solitary and frozen as Scrooge, with its “overflowings sullenly congealed, and turned to misanthropic ice.” Whether moving or static, animate or inanimate, everyone and everything appears to be spilling over, breaking out, extending beyond itself. Dickens’s narrator, too, repeatedly sets out to convince us that the world we share is, or should be, one of liberality, plenitude, intimate connectedness. Whether he is describing Scrooge’s character (“a squeezing, wrenching, grasping, scraping, clutching, covetous, old sinner!”), or the weather (“cold, bleak, biting”), or the objects that make up Marley’s chain (“cash-boxes, keys, padlocks, ledgers, deeds, and heavy purses wrought in steel”), rarely is one detail given when three or four or more will do, as Dickens crams every sentence with alternatives and supplements, like a set of thesaurus entries spread out across the page. Indeed, there are times when the Carol reads more like an extended shopping list than a book, as when Dickens describes the throne of the Ghost of Christmas Present, made up of “turkeys, geese, game, poultry, brawn, great joints of meat, sucking-pigs, long wreaths of sausages, mince-pies, plum-puddings, barrels of oysters, red-hot chestnuts, cherry-cheeked apples, juicy oranges, luscious pears, immense twelfth-cakes, and seething bowls of punch.” That’s quite a mouthful, even for a reader, and one of the problems Dickens confronted when inserting such lists into the Carol, with all the wide-eyed enthusiasm of a small child leaving a note for Santa, is that they might not be properly absorbed into the story as a whole; however lip-smacking each item might be individually, put together like this they run the risk of producing a nasty case of narrative indigestion. Faced with the prize turkey Scrooge sends to the Cratchits, a suspicious reader might then wonder whether Dickens was winking at his readers about the nature of the story he had produced for them. “He could never have stood upon his legs, that bird,” we are told by the narrator, voicing Scrooge’s gleeful thoughts. “He would have snapped ’em short off in a minute, like sticks of sealing-wax.” An oddly self-conscious thing to say at this stage of a story, perhaps, when the writer is close to wrapping up his manuscript and sending it off to the printers, especially given how spindly Dickens’s plot is when compared to the top-heavy nature of his style, chiseled with italics and spattered with exclamation-marks (“It was a Turkey!”). But it takes a confident writer to joke about what he is up to, and a swaggeringly confident one to tease his readers with the thought that he might not be up to it. And sure enough, the delighted lists that stretch across the Carol’s pages serve as a valuable reminder that, even when Dickens’s prose risks sounding strained or anxious, he is fully in control. Writing in an accretive style was nothing new for Dickens; from the start of his career, he had been alternately celebrated and condemned as a writer unusually fond of what George Orwell described as “the unnecessary detail.” However, never before had he set out so deliberately to bring together his style and his narrative subject. 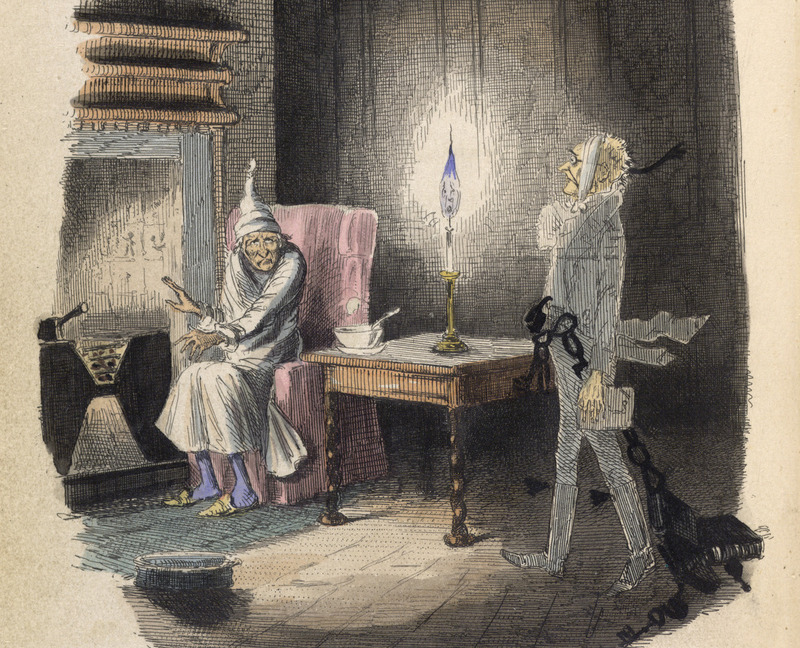 As the Carol develops, even details that at first appear superfluous, narrative grace notes, are revealed to be part of a pattern, “a genial shadowing forth,” designed to alert the eyes and ears of Dickens’s readers to the dangers of assuming that anything or anyone is as “self-contained” as Scrooge supposes himself to be. The light that spills out of the shop windows, for example, which “made pale faces ruddy as they passed,” sets the tone for light to become a central image of the different ways in which human beings, too, might reach out beyond the boundaries of the self: the “positive light” that issues from Fezziwig’s calves when he dances, which is echoed in his power “to make our service light or burdensome”; the lighthouse, which offers a model of cheerful solidarity in the face of chilly adversity; the “light hearts” of Scrooge’s creditors when they think he is dead; the precious burden of Tiny Tim, willingly taken on by his father, for whom “he was very light to carry”; finally, Scrooge signaling his redemption by whooping that he is “as light as a feather.” Gently but insistently, Dickens educates his readers into the need to make connections in a world that might otherwise shiver into isolated fragments. It is the same idea and the same technique he would later develop in novels such as Bleak House, where his listing of objects and urgent cross-referencing of ideas would again reflect his pleasure in the sprawling multitudinousness of the world and his anxious desire to keep that sprawl in check. At this stage in his career, however, writing the first narrative that he had planned as “a little whole,” Dickens seems more confident in his ability to keep his imagination from overspilling the boundaries of his plot, and less worried about his ability to find a style to match the dense weave of affection and obligation that should bind together the rich with the poor, the living with the dead. And the writer with his readers? Who better to remind us that other people are “fellow-passengers to the grave, and not another race of creatures bound on other journeys,” as Scrooge’s nephew puts it, than a writer whose story has asked generations of readers to make the same journey, as each pair of eyes travels across the page to meet that clinching final sentence, at once conclusive and all-embracing, “God bless Us, Every One”? Robert Douglas-Fairhurst is the author of Becoming Dickens (Harvard UP, 2011), winner of the 2011 Duff Cooper Prize, and has edited editions of Dickens’s Great Expectations, Henry Mayhew’s London Labour and the London Poor, and Charles Kingsley’s The Water-Babies for Oxford World’s Classics. He writes regularly for publications including the Daily Telegraph, the Guardian, the Times Literary Supplement, and the New Statesman. From A Christmas Carol and Other Stories, by Charles Dickens, edited by Robert Douglas-Fairhurst. Copyright © 2018 by Robert Douglas-Fairhurst and published by Oxford University Press. All rights reserved.